First things first. Raw rhubarb is not poisonous. I’m glad we cleared that up. Now we can move onto the fun stuff. I first saw it in an August 2007 issue of delicious Magazine and I have been meaning to make it for the past three years, but as these stories always unfold, something has always gotten in the way. It was a recipe by Lebanese-Australian Greg Malouf, cooked with Skye Gyngell at her Petersham Nurseries Café (London), and was served as part of an extravagant Middle Eastern banquet that included pigeon b’stilla, lobster tagine and smoky paprika & parsley tartare. I have never been more jealous of other diners. Last week, after a nice wander to the Eveleigh farmers markets with Tia Bicky, I impulsively bought some goat cutlets and a huge bunch of ruby red rhubarb. I rarely ever buy rhubarb. And now there was a lot of it. Bright, shiny and fresh. And mountains of it. I was going to have to come up with some nifty ways to cook it, then I remembered the salad and became a woman on a mission. Luckily, everything else was already in the fridge! What are the chances? The rhubarb, so sour and tangy, provides all the acidity you need for this salad and thus no acidulent is used in the dressing (lemon, vinegar etc). Lemon zest is used, but its contribution is more aromatic than acidic. I heartily recommend this salad. It tastes healthy and delicious all at once. Recipe by Greg Malouf from delicious Magazine August 2007. Serves 4. 1. Slice rhubarb into very thin strips. 2. Toss rhubarb, lemon zest and salad leaves with half the olive oil. 3. Plate salad leaves and then crumble feta on top. 4. Drizzle with remaining olive oil. Dust with sumac. All the rhubarb was used up and I also made a side of wine braised purple heirloom carrots. Everything tasted wonderful. 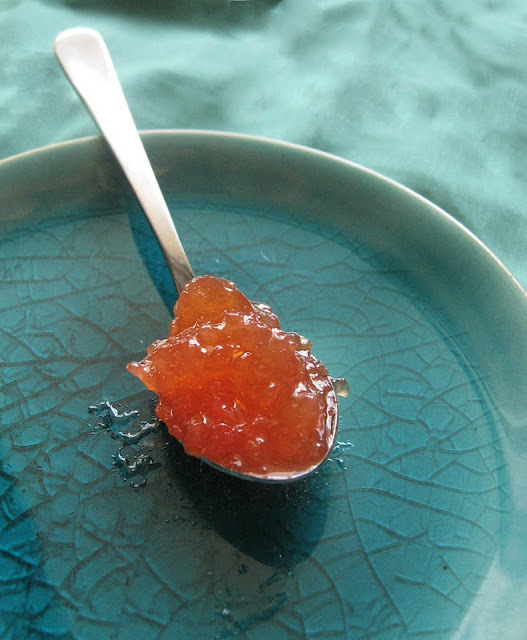 Spoon sweets are wonderful morsels of jammy goodness served all over the Balkans, Middle East and parts of Russia. In the old days a woman’s variety of spoon sweets was a sign of her hospitality, something sweet and delicious to serve her guests while they drank tea. Most usually spoon sweets are made from fruit, with bitter and sour varieties being the most prized. I suppose that’s because it took a lot more sugar to get them tasting good, and sugar was an expensive commodity. 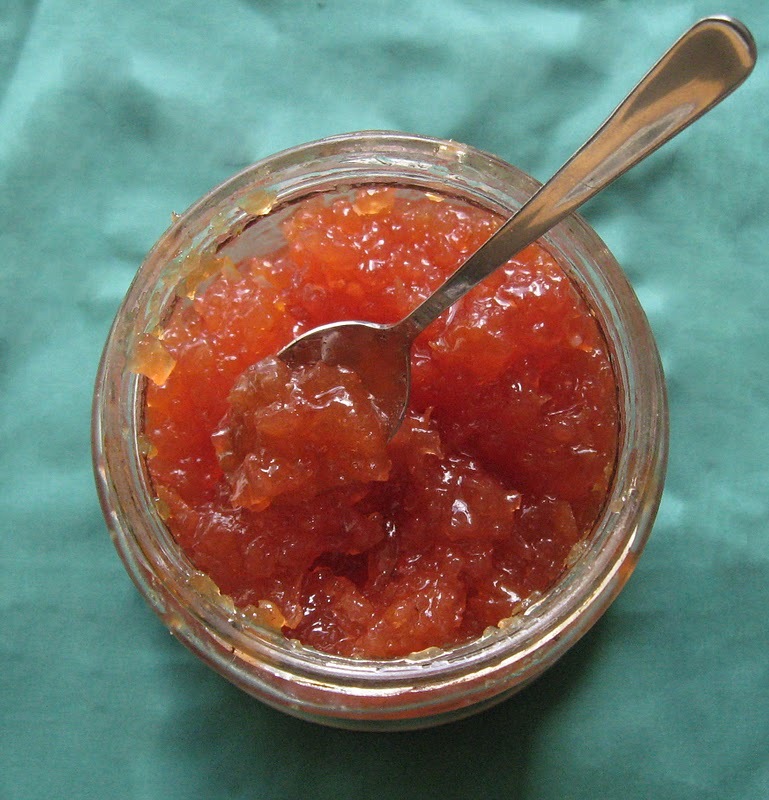 Common spoon sweets include seedless grapes, bergamot, sour cherries, kumquats, pomegranate, figs, green walnuts, watermelon rind, cherry tomatoes, eggplant and rose petal. The traditional way to serve them is to the preserve is packed onto small teaspoons and served in porcelain or crystal dishes with coffee and tea. These days they have other uses too, such as ice cream topping, on bread or as an accompaniment to cheese. Luckily for me, my quince spoon sweet (based on Greek recipes) turned out perfectly chewy and aromatic, the elegant flavour of quince taking centre stage. 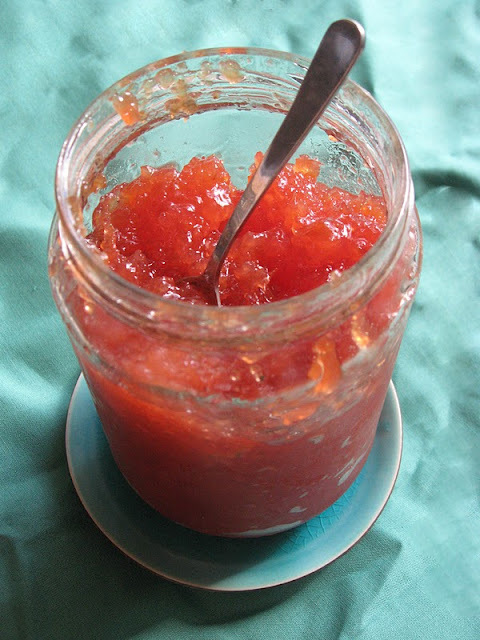 Highly recommended to just eat from the spoon, but I use it for cheese boards and as a breakfast jam too. Anna’s recipe based on this and this. 1. Wash quinces and scrub off brown fuzz. 2. Bring the water to a boil. 3. Grate, with peel still on, discarding the cores. 4. Add grated quince, lemon peel and juice to boiling water. Return to boil. 5. Reduce heat and simmer until the quince is soft (10-20 minutes). 6. Turn heat to high, add sugar, dissolve and bring to a boil. 7. Lower heat to medium and simmer rapidly until jam deepens in colour and firms to jelly when drizzled on a cold saucer (about 40 minutes). 8. If using almonds, stir in now and boil 1 minute longer. 9. Ladle into sterilised jars and seal. It’s the third time that Jonas and I have been to Zaaffran. The first, many years ago, was a romantic Valentine’s Day banquet when I lovingly ate vegetarian food with him. The second was a New Years Eve when some staffing issues resulted in a tasty yet chaotic celebration (isn’t NYE always chaotic though?). And in late September we were back again, this time with a host of food bloggers, being treated to a BBQ Banquet. Zaaffran is located in a strange spot, accessible through the touristy Harbourside shopping mall in Darling Harbour. Fortunately once you enter the restaurant, the bright fluorescent shopping strip is replaced by soft, intimate lighting and the twinkling of the city skyline reflected across the water view. The air is thick with the spicy aromas of the kitchen, promising a good meal. I do a head count around the restaurant and note that more than half the clientele are Indians. Always a good sign! Our host for the evening, owner Rush Dossa, had certainly done his research when he hand-picked the group of bloggers. My own email invitation made reference to a raft of ideas and recipes across the years, indicating he had done more than just skim through my blog, and when I arrived he greeted Jonas and I with knowledge of our lives and even of Jonas’ vegetarian past. It was the first sign of the great warmth and hospitality Rush displayed throughout the evening. Rush had invited us to demonstrate that Indian food isn’t always about curries. And while we all (well, those of us with any sense) love Indian curries, there’s so much more to try from the vast Indian continent and its diverse ethnic groups. And so we were all shouted the 5 Course BBQ Banquet, usually charged at $54.50 per person. We start with canapés on the balcony. Three delightful little morsels: wonderful whole-wheat pancake-like wraps stuffed with mushrooms, mint, coriander and cheese; fat and round potato dumplings plumped up with carrot, peas, ginger, cashews, mustard and chilli; and spoons of prawns in fragrant coconut broth flavoured with saffron, chilli, lemon and lime. So rich and flavoursome, easily everyone’s favourite of the canapés and already sparking ideas for new recipes at home. To start the meal proper we’re served a pleasantly-salty salad of greens and brimming bowls of pappadums and steaming garlic naan. The four colourful dips are a thick, syrupy date chutney (not too sweet), beetroot & yoghurt, tomato & chilli and mint & yoghurt. Surprising even myself, the date turns out to be my favourite. Gol Guppas are next. These strange mini pooris are like the Indian answer to Mexican tortilla chips and salsa. Their hollow, spherical shape was perfect for holding the moong bean & potato mix, and dousing in mint or tamarind water, then shoving into our gobs before the liquid destroyed the thin crunchy shell and gushed all over us. My favourite starter, as always, was the chaat. I’m a sucker for these street snacks, usually made out of vegetables (spinach, potato), always drizzled with mint, yoghurt and tamarind. I adore them and Zaaffran’s Aloo Makkai Tikki Chaat were particularly good: 20-cent sized circles of warm potato and corn crisscrossed with yoghurt, date-tamarind and mint sauce. Our second course arrives: Tandoori King Prawns and Chicken Seekh Kebabs. The prawns are cooked perfectly and flavoured heavily with cardamom, their tails crunchy enough to eat. The chicken mince kebabs are flecked with loads fresh minced coriander leaves, just the way I like it. They serve the second course with mushroom and truffle naan! It's delicious, and while there's a heady scent of truffle in the air, the truffle flavour is not very strong. Fried seasonal fish turns out to be barramundi. The flaky white fish meat is complimented perfectly by a very spicy, crispy batter and a side salad of red chilli and spinach. The oven-roasted salmon is flavoured with ginger, garlic and chilli, then covered in a lemon-turmeric reduction, drizzled with mint chutney and sitting atop a bed of fiery mustard mash. A surprising winner. Interestingly, we’re served a small scoop of mango kulfi to cleanse the palate for the next course. In European restaurants, this is usually served after the savoury courses and before the sweet dishes, but after the spicy fish dishes it’s an excellent reprieve before launching into the meats. Jonas hates eggplant, which was problematic when he was a vegetarian, but fortunate for me because I love it and therefore get his serving. At Zaaffran they served thin slices topped with spicy lentils and doused in tamarind and mint sauces and fresh yoghurt. Tandoor lamb mince skewers, singly with the vibrant notes of onion, herbs, ginger and garam masala, lay across pretty streaks of bright pink, green and black sauce. The moreish, rich lamb ribs had been braised and roasted, flavoured heavily with ginger, honey, pepper, cardamom and yoghurt. They with an inspired and wonderfully refreshing salad of julienned celery, carrot and green apple – a perfect accompaniment to the fatty ribs. Dessert was a combination of the usual and the unique. Kulfi, an Indian classic, was taken to new levels in a cone of subtle saffron, luscious honey and almond crunch. I adored it. The sphere of rose kulfi was almost as good, but matched the dome of gulab jamun well. But the hitherto untried, newcomer on the plate was the Bibinca, a Goan multi-layered cake strongly spiced with honey, nutmeg, cloves and cinnamon. Overall it was a wonderful evening and Rush and Vikrant were very successful in demonstrating how amazingly diverse and delicious Indian barbecued food can be. The regular BBQ menu that we were served is great value for money at $54.50 because you really do get a lot of food and a chance to sample a wide range of dishes from the delicious Zaaffran menu. Yes, I will be back to Zaaffran again for Round Four! I was lucky enough to attend the Zeta Bar’s invite-only 5th birthday party on Wednesday night. Zeta is a wonderful cocktail bar in the Sydney Hilton, and over the last few years I’ve had some bloody good cocktail experiences there, even if I couldn’t always get past the bouncers and into the lifts. • a caramelised pineapple martini where my fruit had been grilled until smoky, moments before it was served up. But this time my name was on the list and, after being asked for ID (wow! even at my age), I was in! The bar was alive, crammed with people and buzzing on the Beach Chic theme. The second we stepped out of the lifts waiters greeted us with our first tasty treat. ﻿ Despite the weather being unseasonably stormy this year, Sydney came dressed in our Beach Best, with a whole lot of colourful maxi dresses, flowing full skirts, tiny shirt dresses, men in indecently scooped V neck shirts and amazing array of sandals and mandals. The bar shovelled in tonnes of sand, hired models to strut around near-to-naked and projected images reminiscent of Beach Blanket Bingo on the walls. But I was here for the cocktails, and Zeta did not let me down. No less than 10 alcoholic beauties were offered up for consumption. I drank up every drop, and felt very queasy in the AM. An original Bellini (peach) with Peach Air - DIVINE! Five types of alcoholic sorbets - I tried them all! Fresh Lemonade with Belvedere - DIVINE! Other items I tried but forgot to photograph included the Long Island ice tea snow cone, Chandon nitro puffs, avocado and egg nori rolls with soy sauce, fried pumpkin and ricotta parcels with passionfruit sour cream, Kohuna ham & pineapple mini pizzas, coconut crumbed prawns with mango mayonnaise, crispy fish & chips with lemon in a noodle box, mini cheese burgers with pickles. This is a great, easy breakfast. This is a Turkish-style egg dish, so it’s not too far from your traditional brekkie fare. But it’s eggs with a twist. Herbs and tangy cheese and a pinch of tart sumac. Based on Binnur’s recipe. Serves 2. 1. In a bowl, combine the feta, scallions, herbs, sumac and pepper. 2. Heat the olive oil in a frying pan over a medium heat. 3. Crack all eggs into a bowl. When the frying pan is hot, add the eggs. 4. Immediately sprinkle the feta mixture over the eggs. 5. Cook for approximately 8 minutes, or until the eggs have almost cooked but the yolk is still runny and the feta has started to melt slightly. Serve hot with Turkish bread. These delicious puddings were a great little discovery. Based on Haalo’s Caramel Croissant Pudding, I used up all the leftovers in the fridge and cupboard to make an elegant and unique dessert that was not only tasty but soul-satisfying on a cold night. You could make it with any combination of fruits and liqueurs. 2. Chop the fresh pear into small pieces. In a saucepan, heat with butter over low heat for around 5 minutes until moisture is reduced and pear starts to break down. Break up further with fork into a lumpy purée. 3. Tear the croissants into small pieces and layer into oven-proof tea cups with pieces of dried pear and pear purée. 4. Put the caster sugar, eau de vie, water and earl grey tea into a saucepan, and swirl around to help dissolve the sugar before putting the saucepan on the hob over a medium to high heat. Bring to the boil then simmer for 2 minutes to release the flavours of the tea. 5. Strain the syrup into a new saucepan, discarding the tea leaves and then add the cream to the earl grey syrup. 6. Turn heat down to low and heat the mixture to a simmer. 7. Take off the heat and, still whisking, add the beaten egg. 8. Pour the custard over the croissants. Leave to steep for 10 minutes if the croissants are very stale. 9. Place the tea cups on a baking tray and bake in the oven for 40 minutes. 10. Serve warm with honey-lavender ice cream. Note: Alternatively, substitute poire williams eau de vie with amaretto.